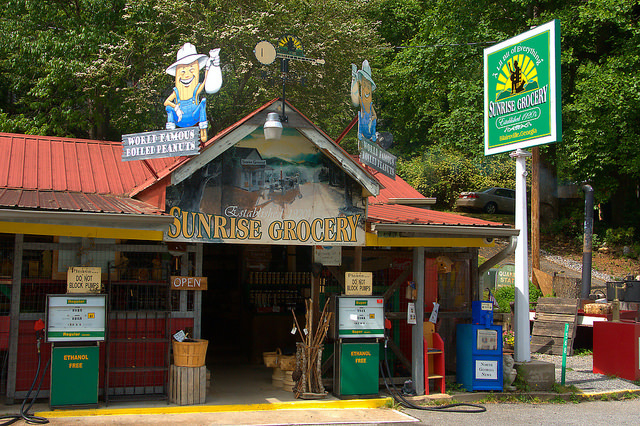 Though its exact date of establishment has been lost, the old Sunrise Grocery began as a Pure Oil station in the early 1920s. It became known as the Sunrise Grill in the 1940s. With several owners over the years, Sunrise Grocery has evolved into a local landmark and a go-to shop for the folks who hunt, camp, and fish in the area. Besides “convenience store” items and gasoline, they also sell local produce and regional arts and crafts items.